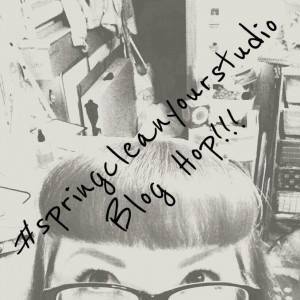 “All dressed up with a dirty neck.”… #SpringCleanYourStudio Blog Hop!!! What?? Spring is here!! I gotta do what, clean my studio…? You know what happens when you have systems in place, that is the only thing that is your saving grace for disorganization and clutter. 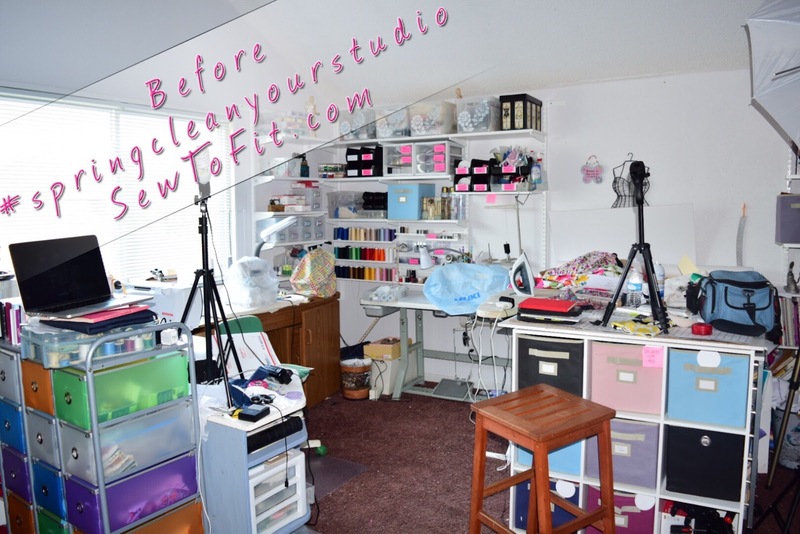 If it weren’t for the system I set up during my non-busy days, then cleaning up the studio would be a monumental task. So when my fellow ambassador, Cheryl, called out for folks to participate in a blog hop of studios for spring I was right on the band wagon since another well known blogger, Rhonda Buss, had already made a “call-to-action” to share. UNTIL….. I opened the drawers and found “stuff” that was just stuffed into them hidden out of sight. I call that my “All Dressed Up with a Dirty Neck.” I must have tried to clean up before, and didn’t have time to do a thorough job. That is when I realized, this is what a creative genius looks like in action…. I love being able to move around so freely in my space. I love the colors I chose to accent, and I just love how bright the extra large window makes my room. Aside from not having a bed, I could just live in this space, my fridge is in the corner in the picture above. I still have a few more things to do to get it a tad more productivity friendly, but all-in-all, it is just perfect!!! Welcome to my world!! I’ll just go right into it and show you the before pics first for each section and then the after for the second picture. BEFORE Shots: If you follow me on youtube, then you shouldn’t be surprised with my “creative disorganization, the area you most often see on my YouTube channel, is the one with all the drawers and wall units, which are all from the Container Store. 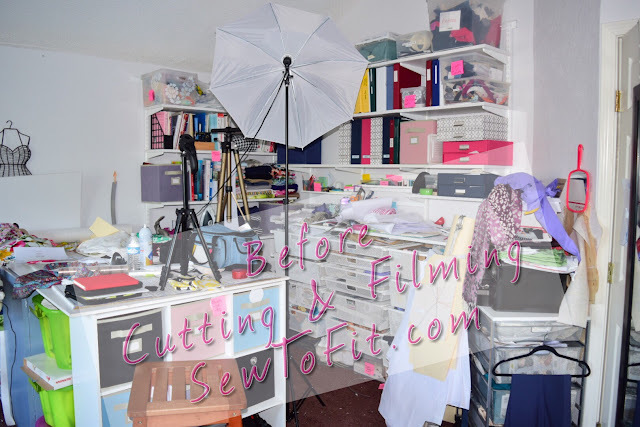 I store all manner of goods in those drawers and boxes and drawers: bra kits, swimwear kits, silk fabrics, current projects, business forms, interfacings, rulers, embroidery supplies, etc. It is all there, ready to go whenever I am. My fabric stash is all in here “stashed” away in bins, and under the cutting table. Some fabrics, mostly cottons and knits are out on shelves, and wools and fancies are hanging on the rods for now. There is a place for everything, if its not in place, then I’m in a creative stance currently, and need it all out while I think and dream. That is the way I work. I may lay fabric on the floor, see that on the floor above?.. or hang it over the rod, or over the door or dress form until I feel what I want to make of it, then I dive into the project. I am always working to improve the flow of my space. By using folding tables that fit well with the flow of the room is helpful when I have guest or students visit. As time goes on, I have acquired extra “stuff” that has taken room normally used for a student. So that will change as I get to clearing out other areas of the room. Corners are terrible with stashing overages and forgetting them. I am sad to say that my bad spot is behind the curtain…a very large television, since I overtook the media room to make this my studio. That is the area I am mentally planning actions for improvement. Until then, this is what I work with, and its my world and who I am. I will continue to update you on the progress for the “other” side of the room in the next few months. This is gonna take a while. 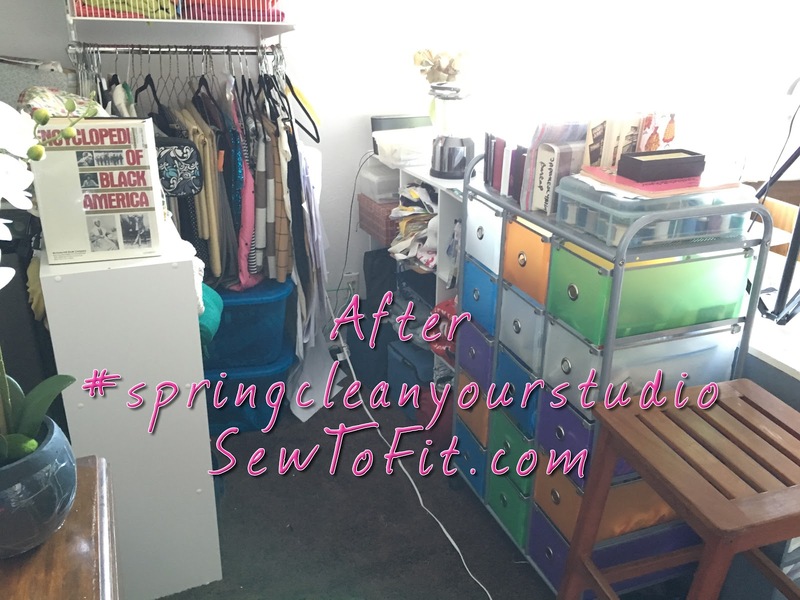 If you have pictures you would like to share on your journey to #springcleanyourstudio, please hashtag your social media post and share on your blog or link your pictures here. In the meantime, remember to check out others on this hop, if you want to see how others create in their rooms. April 25th – Andrea Davis – ME! Busy-ness in my studio is what I would call “all the activity” going on in my little slice of the world. However, I have been remiss in sharing with you my daily adventures due to the style of my blog. I don’t want to flood you with rantings, so, I have taken to updating quick post via Instagram, Twitter and Facebook, as a means of rapid firing quick snippets of the fun that goes on behind the scenes of Sew-To-Fit. Occasionally, I may take on an even more challenging and extended project, such a a wedding dress. You never know. You just have to come around to see for yourself. 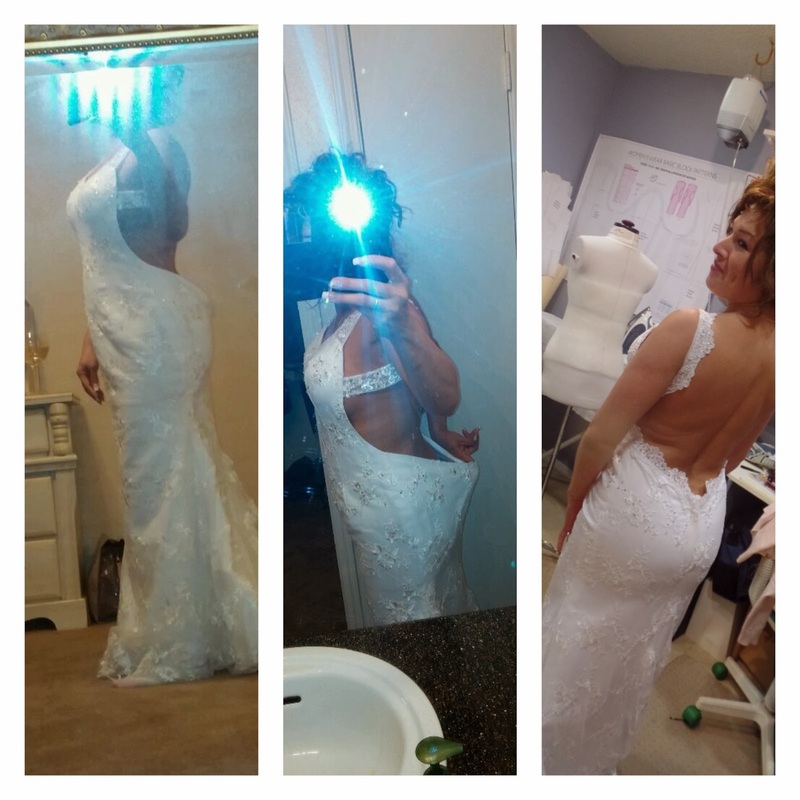 A Tital-wave of a wedding dress..Now this was a challenge!!! I actually do alterations sometimes for close friends and family and sometimes “others” if they play well, heck, I may even make a dress or two every once in a while. OMG, is that grey hair peeking out. I am so involved. If someone calls me and I really am up for a challenge, I might accept a charge to remake or rescue a damsel in distress, such as with this bride who ordered, “God forbide” a dress from China!!!! Oh, the horror. I call this the China disaster. I was delighted to take on the challenge and work it out for her…only because she is a friend and co-worker of my daughter, otherwise, this would have been something she would have had to endure alone. Consider joining me, by checking my sidebar or visiting my inta-feeds on Instagram and Twitter @sewtofit and like my Facebook page @sewtofit. I’m looking forward to having you join me in sharing my daily, sometimes hourly behind the scenes updates. 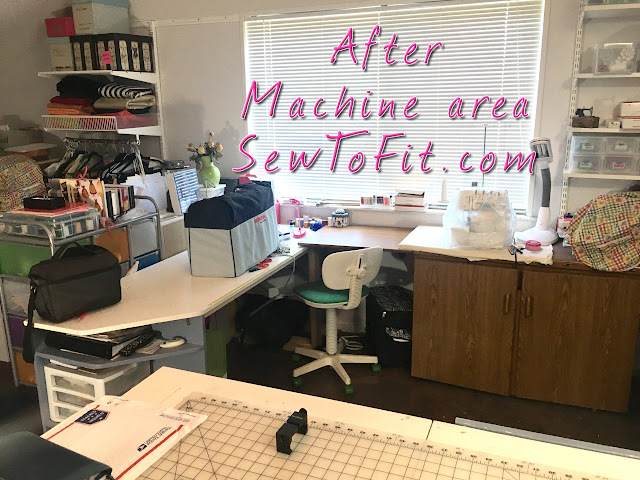 Then returning here once or more times each week for a more in depth explanation of what I come up with during my sewing journey. Just a peek into my world..
You never know you might very well enjoy my ranting so much so that you decide to make my page your homepage when you login to the worldwide web. Until then, thank you for joining me in sharing the things I enjoy the most. Well the title sounds good. But the reason for this post is to remind myself, that when my creative juices start flowing, I still have to remember to stop and do what I hate the most…clean up. I kick up more dust when I work that until I’ve taken a break, I don’t really see the mess I’ve made. Whew! This IS bad. 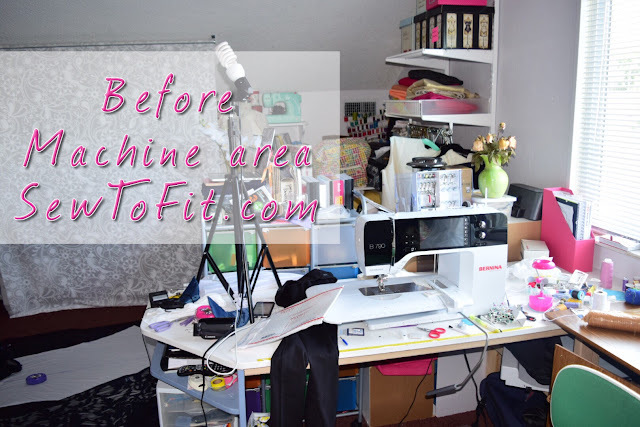 This is where I sit and sew when I am doing construction work. So, I guess the only reason I don’t notice the rest of the room, is because this is kinda quaint. I like being put into the corner to work. Just last week this room was really clean. I must not have had anything to do, or maybe, I just didn’t “see” it. Seems everytime I really, really want to get some work done, I can’t find what I’m looking for. (Wonder why? Right?) lol. I know this is shameful, but I guess when we really stop to look behind once we’ve been really sewing, we can see the “dust” we kick up in our wake. Hence the reason we must stop to regroup regularly between projects. Looking closer, I can see some of the leftovers from the projects I completed last weekend. As I look back on this picture journal, I realize that I must have been switching mental gears a hole lot. Wow! “Sidetracted” for sure. I have several areas of stress that may cause serious problems when trying to get something done. First of all, I don’t have a really good way to manage my patterns. Secondly, they are all over the place… literally. This is a totally different room of the house. My family must really love me…..
Fourth, my closet is a holy mess. The stuff is literally sitting on top of the organization bins that I bought to get organized…. Well its obvious I do have a system in place. ….note the bins overhead and the magazine and file holders. I just have to get it all back in order, and start planning my work. Not just diving in and going at blindly. Get a routine working through each project.